These are powerful stories. Some of which we were given and bought into. Some of which we created based on meaning and context that was quite often limited at the time. And yet, we carry these stories with us. They influence how we see ourselves, others and the life that we are leading. These stories help us create our beliefs which in turn influence our choices which, as we know, create the life we end up leading. Pretty amazing right? For a story I mean. And I will call them a story because most of the time they are made up things we tell ourselves that we choose (and keep choosing) to believe as truth. And if so, whose truth do they belong to? Yours? Your parents? Family? Society? Peers? The Media? The biggest problem with these stories is not that so many of them are negative (and they are sadly), it’s that we so rarely ever stop to examine them. To choose them consciously and purposefully – or to change the narrative. Take being ‘lucky’ for example. 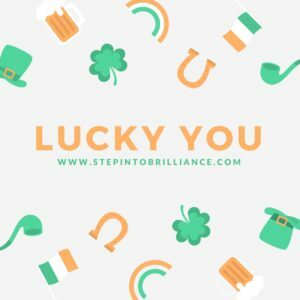 Are you lucky? Unlucky? Perhaps in certain areas you might consider yourself one or the other. I mean, I’m sure there are a few of us out there who have said they felt ‘unlucky in love’ right? This too is a story. And more importantly a mindset that YOU can shift. Simply explained it is case of “where your attention goes, your energy flows”. Add to that, it’s where your beliefs (and of course your experience of life) is built. Need an example? Well let’s say we have two lovely people. Jill and Jane. Jill tends to believe that she is an unlucky person, life is hard and she gets a lot of bad breaks and it’s not her fault. Jane things that she is usually a pretty lucky person, life works for her and that she is responsible for where she is in life and how she experiences it. Both buy a lotto ticket with a pot of 25 million and at the end of the week each wins $50. Take a moment before reading further and think about how each would react. Seriously, don’t read further. In your mind feel it out for each woman for just a moment or two. Right. Jill is going to most likely lament how unlucky she is that she didn’t win the big one, dismiss the $50 as pointless and probably waste the money and then complain about that too. Jane is delighted about the great return on her price of a ticket. She feels happy and thinks of it as a windfall and plans carefully what she is going to do with the extra bit of money. Did you notice how for each woman, her belief was reinforced by her reactions? This is what happens to us every single day as well. THIS is how we create a life. So here’s the good news. It’s all optional and malleable. You get to choose. Although I’m sure a four-leaf clover wouldn’t hurt, if you want to be lucky, decide that you are. Watch the magic happen! So here’s the question I leave you with. If life is really just a bunch of stories we make up to explain what is happening around us – why not make up good ones?